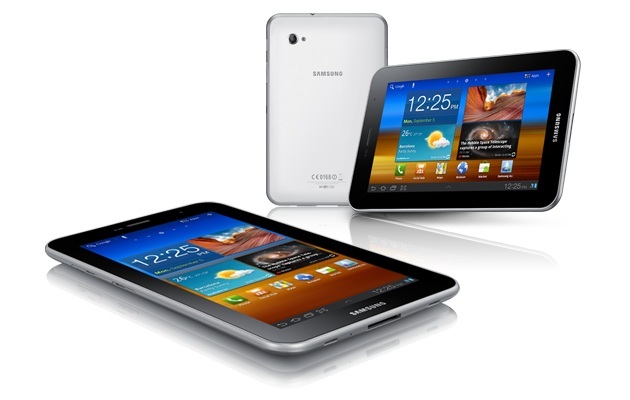 Samsung’s revamped smaller tablet, the Galaxy Tab 7.0 Plus is bound for T-Mobile. The carrier announced that it will carry the 7-inch tablet beginning Nov. 16. The Tab 7.0 Plus is a revamp of the original Galaxy Tab 7-inch tablet, but shares most of its design characteristics with the recently released Galaxy Tab 10.1 and Galaxy Tab 8.9 tablets. That means it’s quite thin at 9.96mm (though not as thin as the larger tablets) and the lightest Galaxy Tab yet at just .77 pounds (345g). The Galaxy Tab 7.0 Plus is a fully-featured tablet, running on Google’s Android 3.2 (Honeycomb) operating system with Samsung’s TouchWiz user interface, a 1.2GHz dual-core processor, 16GB of internal storage, 1GB of RAM, a 3MP rear camera, a 2MP front camera, and a microSD card slot for expanded memory storage. It also has a 1024×600 pixel screen. Full specs can be found at Samsung’s official site. Unfortunately, a nice tablet doesn’t come cheap. The Tab 7.0 Plus will be available on Nov. 16 for a $250 “down payment.” After you purchase the device, which requires a 2-year data contract, you’ll have to send in a $50 mail-in rebate to get that price and also make “20 interest free monthly payments of $10.” This makes the total price of the tablet $450-$500 and you’ll be stuck paying for its data for two years. Good deal? We’ll let you decide. We are definitely fans of the larger Samsung tablets, but we haven’t yet had a chance to use Samsung’s new 7-inch device. The Tab 7.0 Plus joins the Galaxy Tab 10.1, T-Mobile G-Slate, T-Mobile SpringBoard, original Samsung Galaxy Tab, and the Dell Streak 7 on T-Mobile here in the United States. You can view the tablets on T-Mobile’s site.